Now that you know that peanuts are legumes and not nuts (assuming that you have first read the How do peanuts grow? page, we can now move on to the anatomy of the peanut plant and the process of extracting peanuts from it. In this article we will discuss the different types of peanut plants, where they grow, how the plant produces peanuts and how to harvest the peanuts. In the article on how to grow peanuts we will discuss how you can grow your very own peanuts using everyday materials. We do not want to make the assumption that you already know everything about how the peanuts grow on the peanut plant. In this paragraph we are giving you a little recap of what is explained on the "how do peanuts grow" page, if you want more elaborate information you should go there. The peanut plant produces its peanuts below the ground, which is quite unusual since most plants produce their fruit above ground. The visible part of the peanut plant consists of green oval-shaped leafs. On the bottom part of the plant little yellow flowers emerge after about a month time. The flowers are able to pollinate themselves, after this happened they lose their little leafs (which we call petals) and simultaneously the ovary on the end of the stem (this is what we call the peg) begins to grow larger. The peg grows slowly further and further away from the plant and eventually touches and penetrates the soil. On the end of the stem or peg is what we call the peanut embryo, this is not a peanut yet but this is what is later going to be the peanut. The peanut plant will keep on growing and will eventually produce around 20 to 40 pods, this depends on a variety of factors such as the weather conditions and the type of soil. It takes about four to five months of warm weather and enough water (from rain or irrigation systems) for the peanut to grow. The peanut plant grows best in a sandy soil although it is also possible to grow peanut plants in regions where the majority of the ground consists of clay. As you know from reading the article on different types of peanuts we distinguish four major peanut types on this website: the Valencia peanut, the Virginia peanut, the Runner peanut and the Spanish peanut. All these peanuts grow on different plants. 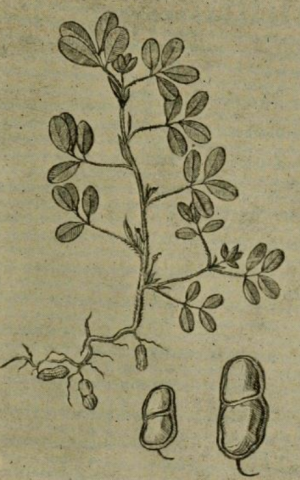 The growth process of the peanut on the different plants is basically the same, but it is possible to distinguish some differences in appearance. Below we will discuss the different types of peanut plants and how you can see what kind of peanut plant you are dealing with. Generally we distinguish two kinds of peanut plants: the bunch peanut plant and the vine-like runner peanut plant. The bunch plant is about two feet high and the runner plant is about one foot high. Both have little yellow self-pollinating flowers and green oval-shaped leafs. The flowers only appear on the bottom of the peanut plant and they fertilize themselves. Eventually the flower will produce a stem (this is what we call a peg) which contains the budding ovary on its end. The peg will grow longer and eventually touch and penetrate the ground with the peanut embryo on it. The ovary at the tip of each stem will form a peanut pod. Each pod contains about two to three seeds (these are the peanuts). If you leave the pods in the ground for too long they start sprouting and the whole process starts all over again. Where do peanuts grow in the United States? The peanut plant grows best in loose, sandy soil although it is possible to grow peanuts in basically any kind of soil. The best climate type for the peanut plant to grow is a tropical or subtropical climate, that is why most of the peanuts in the United States are grown in the Southern States (such as Texas, Georgia, South Carolina and Tennessee). Peanut plants like hot weather but also need plenty of water to grow, this can be a bit of problem in dry states such as Texas, that is why farmers make use of irrigation systems. The seeds for the peanut plant are planted in late spring, basically ranging from late April to the end of May. About four to five months later the peanuts are ready to be taken out of the ground, they are then dried and ready to be stored. The different types of peanuts grow in different places. The Virginia peanut, as its names suggests, mainly grows in Virginia and North and South Carolina. The Runner peanut is mainly produced in Alabama, Georgia and Florida. The Spanish peanut is grown in Texas and Oklahoma and the Valencia peanut, which is the least grown peanut in the United States, predominantly in New Mexico and Texas. Where do peanuts grow around the world? The peanut plant requires are warm climate to grow, these warm climates can be found in Africa, Asia, Australia, North and South America and Southern Europe. According to the numbers of the United States Department of Agriculture (USDA) every year over 32 million metric tons of peanuts are produced worldwide. The main producers of peanuts is China with about 40% followed by India that accounts for almost 20% and the United States with around 10% of the worldwide peanut production. Other countries that produce peanuts on a smaller scale are Nigeria, Argentina, Indonesia, Malawi, Senegal, South Africa, Sudan and Chad.